Teen Patti is very famous game in India and overseas countries. Game is quite addictive and it’s free to download. Now a days, freecharge is overwhelming with lots of offers and discounts. 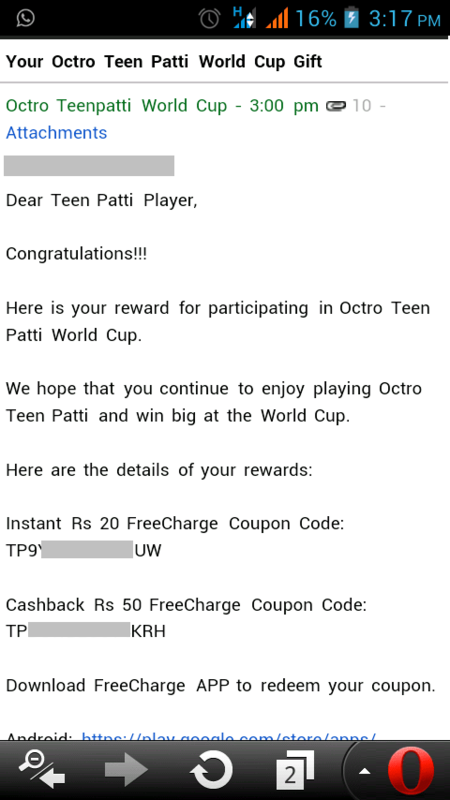 1) From 24 November 2014, Teen Patti Octro World Cup will start and winner will get exciting prices every day. 2) But, every participants will get assured 70 Rs Freecharge Voucher and winner will get 100 Rs coupon. 3) Just download Teen Patti game for android using this link ( ios user click here) and login with Facebook. Participate in world Cup game and you will get assured 70 rs freecharge free fund code. 4) Offer is valid till 13 December 2014 and you can get more information about this offer from here. Offer expired on 13 December. You should get it by email. But many people are saying that they are not getting mail. So try your luck, I got my rewards on very first day when they started offer. Promotion is going to stop on 13 Dec. Hopefully you will get it before 13 if you have followed all steps correctly. Yes, but make sure that you have installed latest version. I got 2 promocode n. But i am puting first promo code on freecharge app than showing invelid code. So admin please tell me what is a problem. Just go to freecharge Facebook page and message them in inbox…. They will definitely help you…. I don’t know what’s problem with 3 patti, but they were sending mail before 10 days. There might be some bugs in the system. Please have a patience. I hv entered contest last evening! I already have the game installed so will I get the recharge if I play from there? If you can see World Cup Contest option, then surely you will get recharge. Have you given correct mail id at the time of entering contest? Just clear data, login with new fb account and participate in contest using new email ID. That’s only solution for it. You will get it within 6-7 hours from the time of participation in world Cup contest.